They say a picture says a thousand words. I must admit I'm not entirely sure who 'they' are, but I thought I'd take them at their word and instead of writing a lot of words, I'd post a blog with a lot of pictures (OK it'll still have words!). No point in posting random pictures of course, so I selected some very interesting (to me at least) pictures which I think tell a story. I think the following pictures bring some perspective to my grumps and misgivings about cycle infrastructure in Glasgow. I was playing with Google Maps, as you do, and I was interested in the 'Bicycling' option that you get if you zoom in to certain areas. 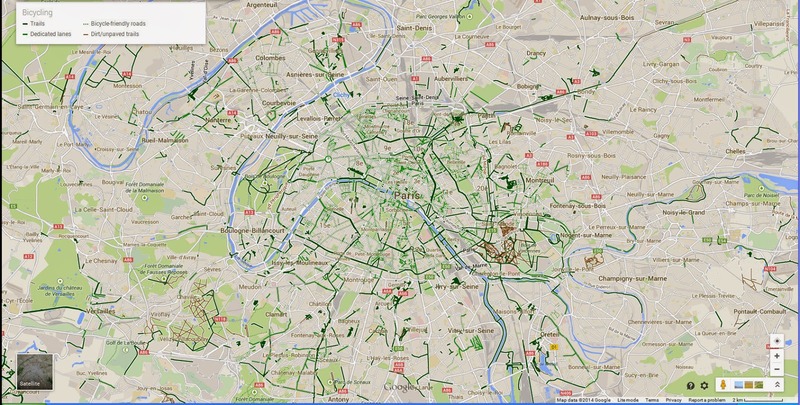 If you are looking at an area, say a city, for which Google has cycle infrastructure information, you get a map of green. 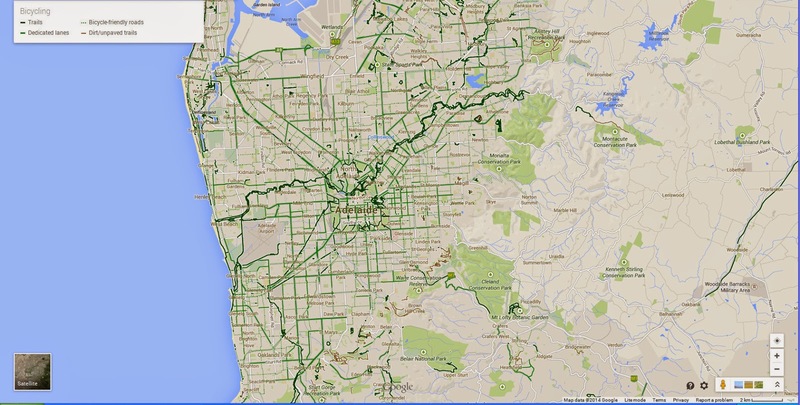 At least, you get a map of green if there are decent cycle routes (I do not know how they classify decent!) So how does Glasgow look when you compare it to other cities around the world? I'll start with some obvious comparisons and throw in a couple of interesting ones. Then I'll say what I think the pictures say. All the maps are at the same scale. First the disclaimer. 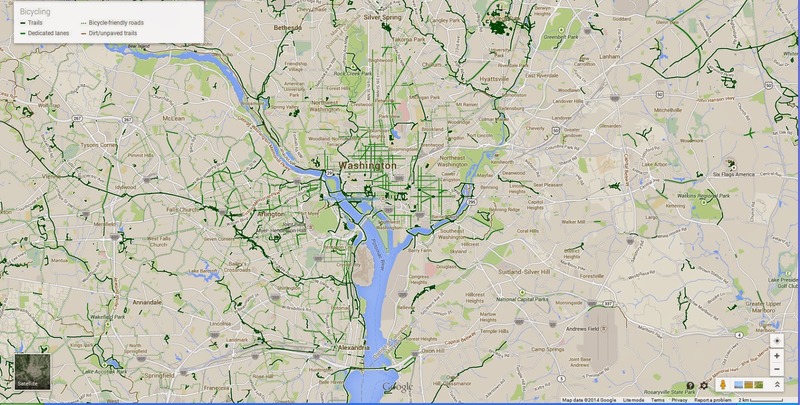 I have absolutely no idea how Google defines bike paths, and I certainly have no idea how it defines 'cycle-friendly roads'. Looking closely at Glasgow I know for a fact that at least some of these so called 'cycle friendly roads, are far from it! Thus, we can't read too much into the maps. Direct measurements of the amount of high quality infrastructure are not possible. 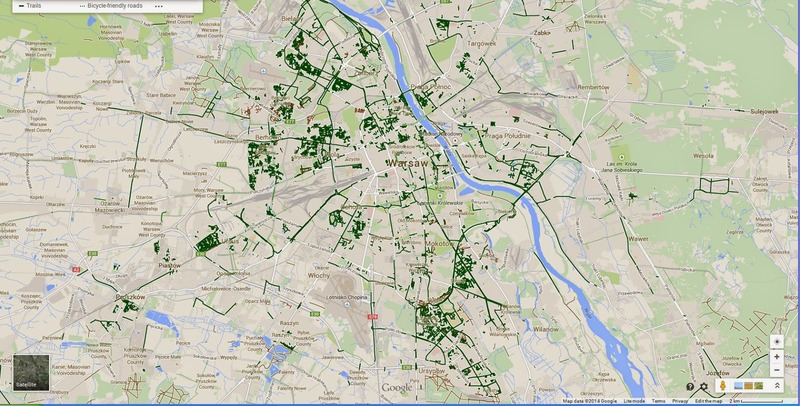 For example I know 99% of Amsterdam's infrastructure is better than 99% of what Glasgow has! 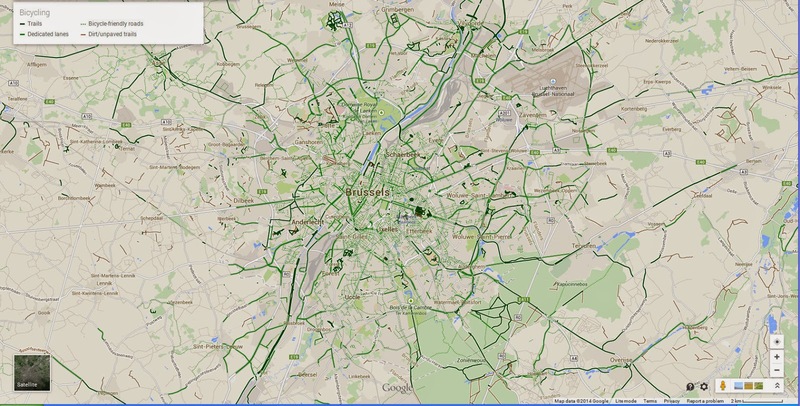 On nearly all of the non-UK maps, just by looking at the green lines, you get an idea of the layout of the city. You can work out where the centre is by just looking at the green lines. They generally radiate and occasionally circle the city centre. In comparison, if you look at Glasgow, which I think (even ignoring my bias) is the worst of the UK cities I've listed, there is absolutely no pattern to the green whatsoever. Look at the green only and you'd be hard pressed to pinpoint the centre. Glasgow and other UK cities are pretty damn poor at building and investing cycle infrastructure. It's actually quite embarrassing looking at these images. For a city Glasgow's size the lack of infrastructure is quite shocking (the scale of each image is the same). However, it goes beyond the amount of infrastructure. 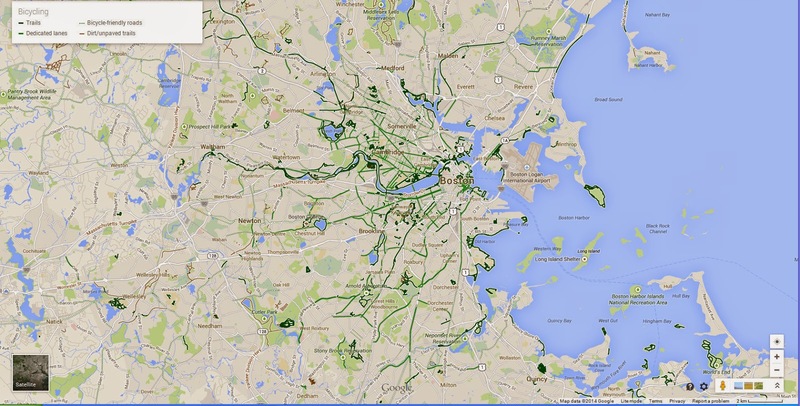 The green you see on nearly all of the cities where it radiates from the centres look..... planned. The images scream...PLANNED... at you. Each city is systematically working towards creating (or already has) a viable network of safe routes ,not just in the areas that it is easy or cheap to implement, but where it is needed, i.e. on all the arterial routes of the cites. I know for a fact that Glasgow doesn't have a plan. I know for a fact that it spends other people's money on bits and pieces, here and there without any overarching forethought. 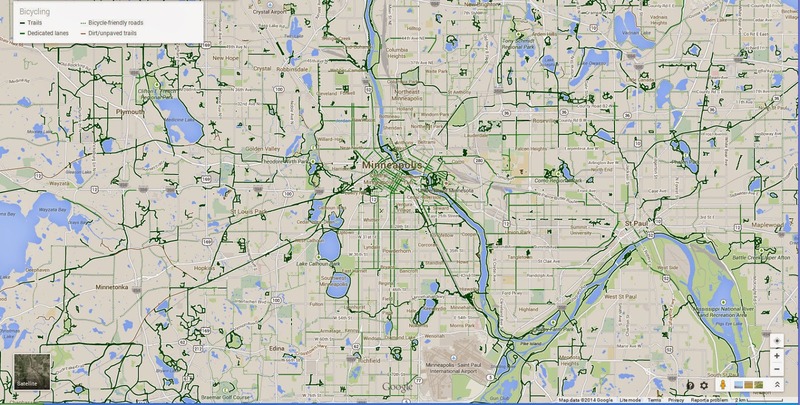 Thus, we end up with a city that does not look inviting to anyone looking at the Google 'Bicycling' tab. There is no way you could actually plan a journey to get from A to B in the city and remain on the green routes. So, when I arrange to meet councillors over the next month or so I'll be making this quite clear to them. We need investment AND we need planning. In fact we need planned and recurring investment. The time for piecemeal cycle infrastructure is over. Anything else and we are resigning Glasgow to many more years as the sick man of Europe. As I can't easily replicate it, how about a shot of Cambridge at the same zoom? Just fascinated to see how it compares. I know for a fact that our infrastructure, despite sky high (for this country) cycling rates, is not something to copy! For instance, it appears that Google Maps thinks Mill Road, a horribly hostile narrow road with some of the worst accident black spots, is a "bicycle friendly road". In fact, quite a few of my least favourite roads are marked as such! 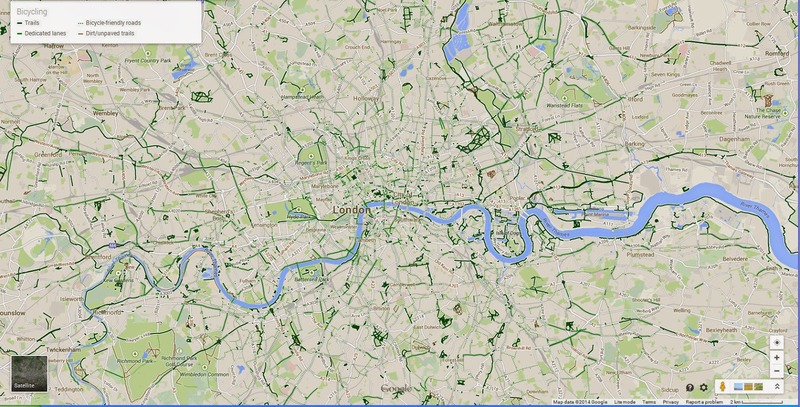 Anyone can edit Google Maps using Google Map Maker - I've done it myself a few times, to add new bits and pieces. There's a review process in place to prevent nonsense edits, but it seems like a bus lane is enough to make a road "cycle friendly" in the eyes of some folk! The idea was to leverage OSM data to form metrics about the extent and quality of cycle infrastructure in (initially) one's MSP constituency. I think the next step would be to create a cycling data warehouse, which would hold this sort of data, alongside other stats such as KSIs, modal share, distance travelled etc. At the moment, IMO too much of cycling data is dispersed and unconnected (a spreadsheet here, a database there). OSM is definitely more complete round me (SW London/N Surrey), and I think Cyclestreets is great, but if you do the same exercise with OSM at the same scale as magnatom uses for London you get what looks like a nice grid of routes displayed in solid blue while Milton Keynes, with its grid of bicycle redways seems to have hardly anything. The London grid is largely roads with no physical intervention (they're mostly the old LCN) except a blue sign and (if they haven't worn off) painted bike symbol on the road. Look at Tokyo, which is at least as cycle-friendly as London, and you'll find a much more realistic picture (i.e. no solid blue); the Japanese at least seem to realise, as magnatom also indirectly alludes to, that you can't just name something and it magically transforms (ta-dah an instantly "bicycle-friendly" road as per Google!). 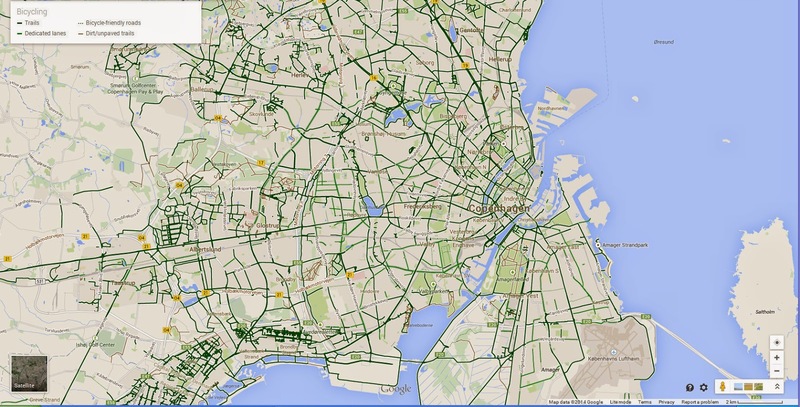 PS -unfortunately, Japanese infra isn't plotted on Google Maps. The key symbol for actual physical intervention in OSM is the blue pecked line, and there are far fewer of those, and they are harder to pick out so they just get swamped by the solid blue. The OSM otaku could probably isolate them but many campaigners would maybe prefer easily accessible on-off switches for some of the display items. The Google Maps display is much better in that respect. However I have another issue with the blue-pecked line as shown on OSM apart from legibility. It encompasses everything from mud tracks to fully segregated 3m smooth tarmac cycle paths. These need differentiating - I believe the US uses a 3 grade scale that could be adapted. There also need to be symbols for shared facilities (bus lanes, toucans and footways). Sure in Cyclestreets you get a description in words, but again if campaigners want to see the full scale of how crap UK infrastructure is, and to be able to demonstrate to planners and councillors where the gaps and inconsistencies lie, they need some way of easily representing, mapping and isolating the different types. 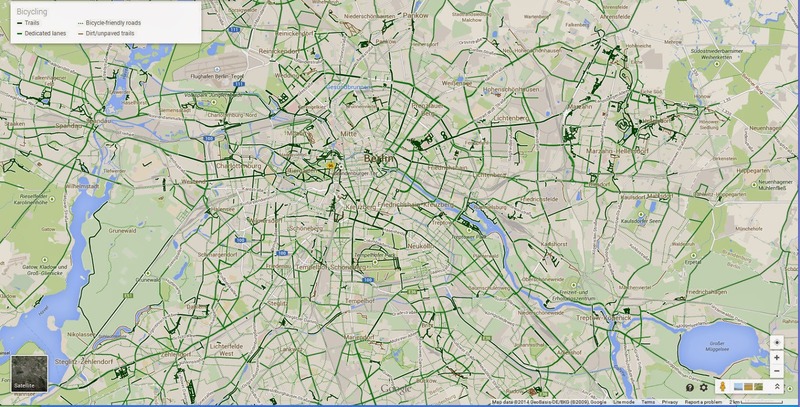 OSM as it is presented is a bit busy, and the user-interface too restricted to do that. Fully agree with your last sentence. I am constantly disappointed at how little publicly presentable background information many campaigners seem to have about their areas ('all in me head"), or a plan of how they see the network evolving. I once had a go at mapping the infra in Glasgow (mostly within the M8) according to type, by running round the place on StreetView. The green (and blue-pecked) lines just dissolve into a dust of different interventions I'll see if I can dig it out & put it on the web . Funnily enough, there's a few up in Glasgow who are trying to solve the problem you highlight. If you dig into the guts of it, OSM data does contain a proportion of the information you're talking about (OSM is essentially a large database with a visualisation stuck on top) - regarding segregated vs. shared use pavement vs. paint on the road. Some key items are missing, namely "surface quality", "smoothness" and "width" *ahem*... happily, it's just a case of going out and mapping these... which is a bit of a pain in the behind frankly. 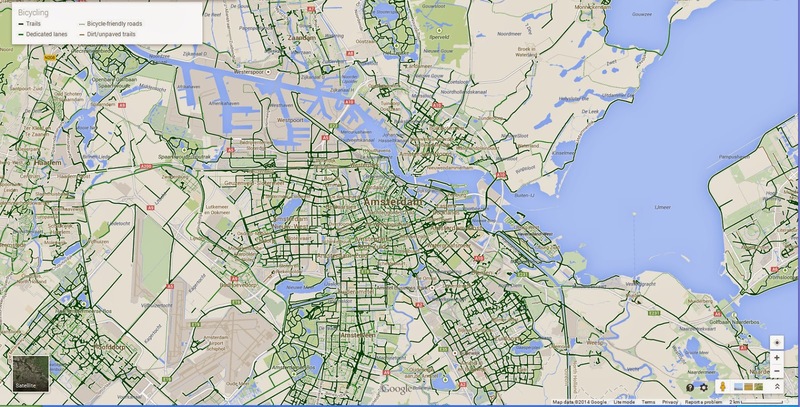 I've argued that it would speed things up if create a really simple OSM editor which was tailored specifically for cycle infra - so that mortals can go in and edit without having to be true OSM geeks. Secondly, the visualisation layer needs to be updated to include these - that is a bit trickier, because I think you would need to get that agreed, approved and implemented by the creator of the cycle layer - similar in a way to the way editing in wikipedia works, you'd need to build consensus on how to represent this data in a meaningful (and legible) way. Although this is a "Glasgow" initiative, there's no reason this couldn't be repeated all over the UK - we just need to get a proof of concept up and running. One thing that strikes me about the UK maps is the way the few squiggly lines around the perimeter that seem to point to the center disappear when they get close to the center. 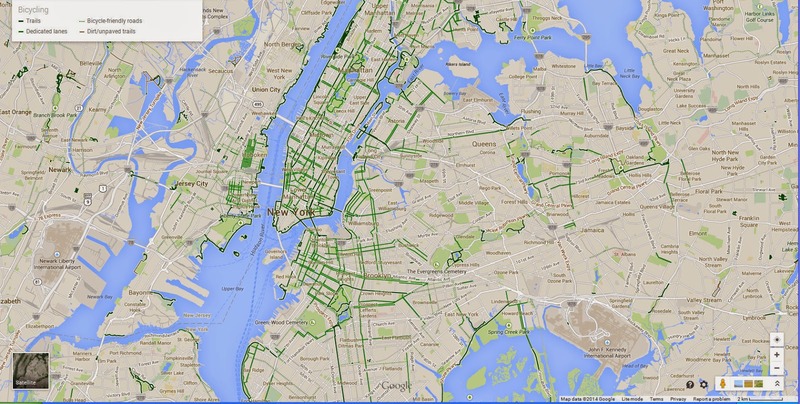 So you can work out where the center is by the LACK of green lines. Says it all really. 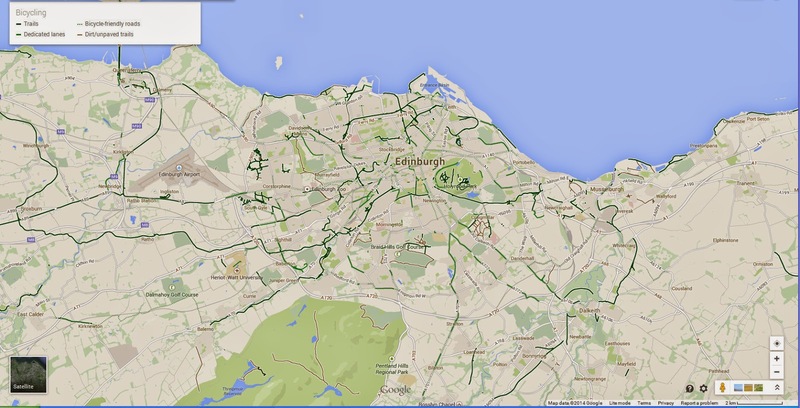 Edinburgh, my main area of interest, has a few green lines which represent old converted railway lines (and the Union Canal) that have been around for donkey's years, and hardly anything else. Green lines conspicuous by their absence. Interesting also to compare the maps of bits of random countryside, after all people live there and other people have to travel from town to town - Netherlands green EVERYWHERE, Scotland - absolutely zip, nothing, nada. An interesting post. Nice one. When I first started doing this, it was suggested that the idea of a planned network was "ludicrous". Jeremy Parker explains here: "The idea of an LCN forgets that there is an LCN already. The entire London street network is the London Cycling Network." More recently it has been said (here) that no one would regard the development of a cycle network as controversial, of course, but it must offer something better than that which is currently available. Which means to say, developing an amenable cycle environment shouldn't be allowed to take many cycles or iterations (as happens with all other design processes), because we know what needs to be done (just look at Holland), so let's aim high, copy the best, and get it right first time. This pursuit of perfection inevitably leads to paralysis. The Vole reports here that despite all of the money that has been made available for cycling in London, and that despite the rise in the political prominence of cycling, there is still very very little tangible progress on the ground. "The Mayor's Vision for Cycling was published 17 months ago," he explains. "Since then, no cycling infrastructure, resulting from that Vision, of any substance, has been built at all." I have completed designs for all of the UK cities you have listed. The most recent to be finished is Manchester. 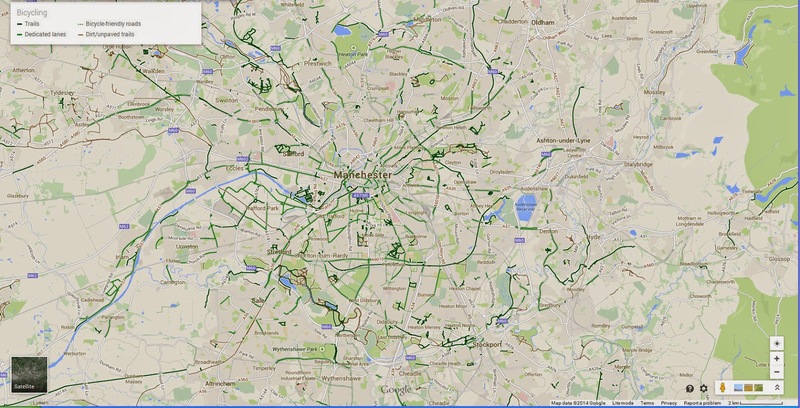 I superimposed my proposed design over the cycle routes on the Google map and created a basic animation. You can see it here.